I absolutely love this salon. I have my acrylic nails and spray tans here and I wouldn't go anywhere else. The salon is beautiful and always clean, the staff are always friendly and so personable and I always leave the salon feeling amazing. Friendly and helpful staff. Excellent results every time! Very pleased with gel nails that are unique and last longer than any other place. The ladies take pride in their work & it shows! The best quality products used. Facials are amazing!! Clean, relaxing & very high standard facilities all at affordable prices! Wouldn't go anywhere else. Cannot praise this salon enough, I visited for the first time today & the girls were lovely. I had sns nails and I can honestly say its the first time I've had my nails done & been 100% happy with them, i felt that a lot of effort was put into my treatment where as other salons I've been to its just like get you in and out as quick as they can. Looking forward to returning. Have my nails done by Sasha and always love what she does! Amazing nails good old chat and just a general laugh!! All girls in there are amaze too always friendly and happy. Love this salon. The girls are so friendly & accomodating. As a person with a lot of experience in the beauty industry i've often felt intimidated going to new establishments but not here. The girls are so chatty & welcoming. Their prices are very reasonable & often they have great offers so whether it's popping in for a quick sunbed or a nail paint I always leave with a smile. 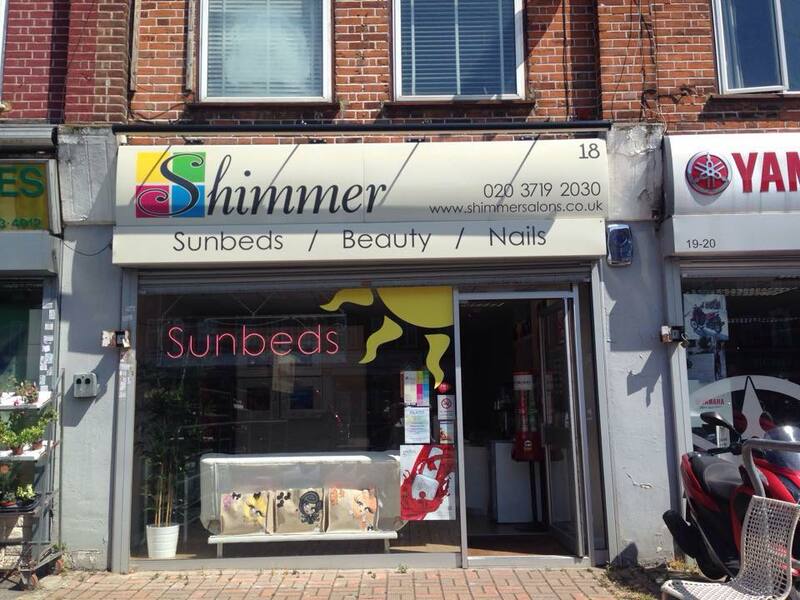 I have my spray tan done at Shimmer by Louise, the best spray by miles! Also clears up my Psorisis too! Have been three times to have gel nails done. Both Dani and Taylor are lovely and have been really pleased with my nails and their advice on colours etc. It's a really friendly salon and would totally recommend it. Feeling very pampered after a lovely afternoon spent with the always lovely and accommodating ladies at Shimmer especially my amazing nail lady Sasha. She is the best at creative nail designs and I wouldn't think about going anywhere else. Very much looking forward to my luxury pedicure next week. Thank you ladies! I had my eyebrows waxed and tinted the treatment was perfect and the girls at shimmer were lovely and friendly as always. Absolutely great! Had a lot of tension in my back, shoulders and legs... All gone now! Great Service delivered by professional and friendly staff. Beautiful salon, with very proffesional and friendly stuff. Had my nails and pedicure done and very pleased with the outcome. Highly recommended! One of the best salons around the area. Staff are always polite and welcoming, very helpful too. The beds are great and being extremely pale naturally, these are one of the only beds/tubes that give me a good tan. They also sell a great range of tanning creams especially the protan. Prices are very good too! Very well presented, clean and modern.